Now if you run the app and tap on the info button in any annotation, the URL should load in a browser. There are a few interesting features that could be implemented further on. Notice that the locations we hardcoded in the array are similar to the JSON data that you can download from Parse. It would be great if we can get them from the cloud instead of hardcoding them. Another useful feature would be to implement geocoding both forward and reverse, so you can either input the latitude and longitude to find an address, or the opposite, input an address to find the latitude and longitude. 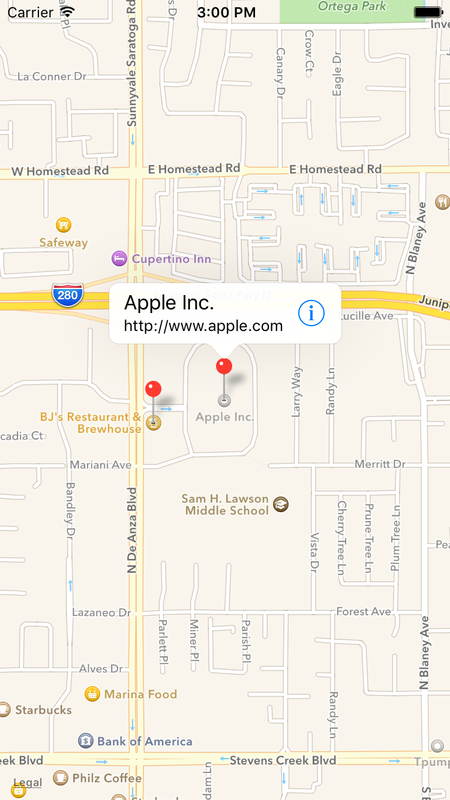 You could also implement searching and displaying of nearby POI (points of interest). The possibilities are unlimited.